You can listen to 'New alphabet' here. Wonderful, glorious is a veiled album. The sound is treated, Mark Everett's voice and many instruments are distorted or otherwise made harsher, resulting in a rough sounding album. Rugged, fierce, tough. 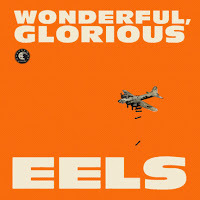 Wonderful, glorious is aptly named. Yes, I'm impressed to be quite honest. I did not know that Everett had it in him to make such a consistent, though harsh album. Like a lot of other people I bought 'Beautiful freak' through the great single 'Novocaine for the soul' and had a relationship with the album full of mixed emotions. This remained so through the years. 'Electro-shock blues' was too dark, 'Daisies of the galaxy' was perhaps my favourite Eels album to date. After that I sort of lost track. The three albums released shortly after one another around 2010 went on and off. The one with 'Hombre loco' on it I liked best. And then: Wonderful, glorious. I even left it alone for a while, but decided to give it a try any way. That's when it happened. I noticed I was intrigued, wanted to hear more. This album is very direct for Eels. Sometimes like a smack on the head, right into my face. 'Open my present' has a blues like overtone, as direct as Spencer Davies Group's 'I'm a man'. A real guitar solo, loud and mean. The song does not sound like the singer earned his present, more demanding one, while twisting someone's arm at snapping point. Making the song down right scary. All very un-Eels like. We have gotten to know Everett as the modest soul and psyche searcher, dealing with past and present hurts and trying to give them a place in his life through his music and lyrics. On Wonderful, glorious we hear a boastful, self-confident artist who slings his music into the world at full force. With everything he has got. Like he sings in 'Bombs away': "I've have enough of being a mouse. I no longer keep my mouth shut". A smaller song like 'I am building a shrine' has a directness that fortifies the delicateness of this beautiful song. To be honest here, I think it has a beautiful melody, such interesting guitar parts and the keyboard gives the finishing touch. However this shrine is for, (s)he better be honoured! Taking Wonderful, glorious all in, I relish the surprises in the sound. The instruments and notes that pop up, the great refrain of 'Kinda fuzzy' as well as the dreamy bridge in this song. The way the very modest 'Accident prone' is lodged in between 'Kinda fuzzy' and 'Peach blossom'. The songs are presented in a way that shows that everything was possible and that there are may ways to play a song. "Open the window man" Everett sings in 'Peach blossom'. It sounds like it that he opened his windows along with his head, ears, eyes, heart and let the fresh air and sunshine in to create the songs on Wonderful, glorious, but did not close them at night, the sometimes scary, lonely night. In the end nothing is veiled, only the sound. The rest is totally direct. Eels has delivered one of the very best to date of 2013 albums. After Nick Cave's 'Push the sky away' another surprise one for me. I just love these sort of surprises.